In 1978, Mary Rago took over as vocal music director of John Burroughs High School and launched one of the nation’s very first competitive show choir programs. Rago was succeeded as director in 2007 by her former student, Brendan Jennings, who is assisted by artistic director, Jen Oundjian. The program’s advanced mixed choir, Powerhouse, has long been recognized as one of the nation’s finest show choirs. An inspiration for the television series “Glee, ” Powerhouse was invited to perform on the Oprah Winfrey Show in 2010 as a representative of the modern high school show choir phenomenon. In the past year, Powerhouse has also performed opposite the cast of “Glee, ” Christina Aguilera, Nelly Furtado, The Canadian Tenors and Foreigner. 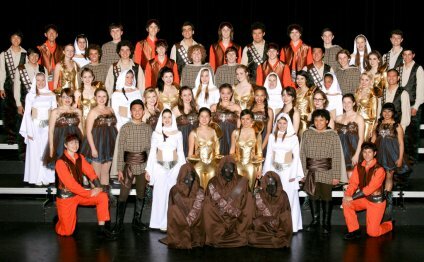 The group was featured in “Gleeful: The Real Show Choirs of America”, a British documentary, was recently profiled on the “CBS Evening News with Katie Couric” and performed on “Dancing with the Stars” in October, 2010. And this past February, Powerhouse traveled to Hong Kong to perform in the internationally televised Chinese New Year Parade. Powerhouse has accumulated countless awards and accolades on both the local and national levels, including Grand Championships at the 2009 FAME National Show choir Cup in New York, the 2008 FAME Chicago National Show choir Competition and the 2007 FAME Orlando National Show choir Competition.